Please run us through the development process for Crisis of the Confederation. Is the creative vision set in stone? How do various team members participate? Unlike A Game of Thrones, which was very much a team effort, COTC is more of an auteur project. I don’t know if that’s simply because AGOT had the advantage of a popular fantasy setting or if it says something about my leadership style. That said, while a lot of the mod is my personal work, I’m always grateful for the assistance I do get. My personal talents run towards writing, game design, and programming, so the people I depend on most are our artists, especially LordKee, who’s the most active of them. A lot of the time, I’ll get an idea, ask him for whatever art assets I need for it, and then bring the rest of it to completion myself. There are a number of people who’ve contributed by adding in new mechanics or filling in the map, and I’m greatly indebted to them as well. The basic creative vision has remained pretty much unchanged since the first brainstorming session, when I decided to get down and actually make that space mod I’d been thinking about. There have been minor changes since then to fill in the gaps here and there, but the overall shape of the setting has always been the same. I’d like to hear more about the interplay between the fiction and the game mechanics. Can you share any other interesting examples? To what extent have you been limited by what’s possible in CK2? The COTC setting’s primary purpose is to provide a stage for interesting CK2 gameplay, and I personally find empires and governments in various states of decay to be fascinating political environments to explore. In a lot of “space feudalism” settings, the question of what happened to our 21st century belief in democracy is glossed over. I wanted to explore that, and I thought the collapse of our modern-day society and the rise of a neo-feudal one would be a great environment for CK gameplay. If you look at the focus of COTC’s custom mechanics, you’ll see that they reflect that. There are a lot of republics in 2998, but they use the merchant republic mechanics, letting you subvert them through political corruption. Military officers are appointed by civilian governments, but the appointment mechanics are designed to let you subvert that process and create a nepotistic dynasty. Constitutional crises and civil wars are the breaking points, where all the little things that have added up collide in a big, hopefully dramatic climax. And I’ve definitely felt myself bumping up against the limitations of CK2 as an engine, quite a bit. Back when I worked on AGOT, I had a bit of a reputation as “the guy who can do the impossible”, and I definitely love to push the boundaries of what’s possible – which, by necessity, means that I’m going to run into those boundaries more often than not. Fortunately, Paradox is usually pretty responsive to my feedback, eventually, and CK2 is flexible enough that even if I can’t do something in a straightforward way, I can probably do it in an incredibly kludgey way. 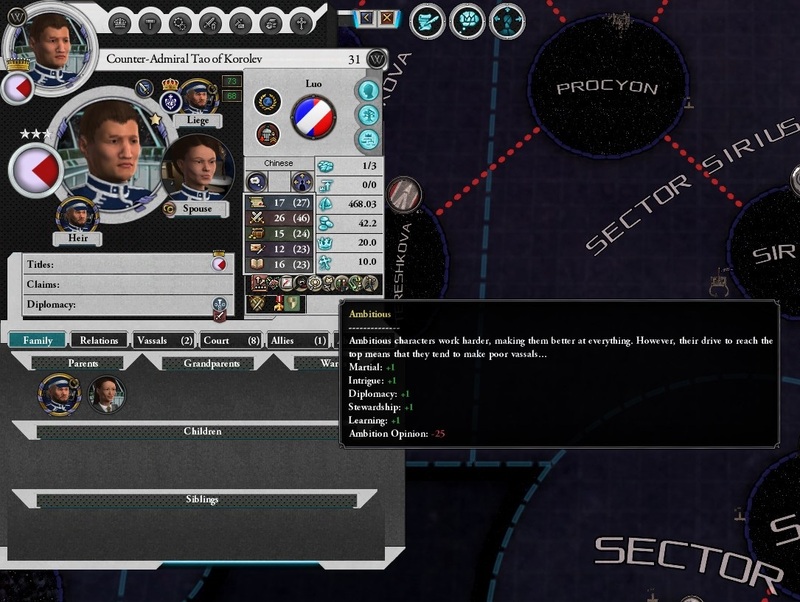 Crisis of the Confederation features a wide array of playable characters, from the President of the Terran Confederation to pirates on the distant frontier. Which character(s) would you recommend to a newbie? It’s a bit hard to say that sort of thing about your own game, but my best guess has always been one of the space pirate kings. Their gameplay is most similar to vanilla, and they’re somewhat free to explore the new game mechanics at their leisure. That’s actually changing a bit at the moment – 0.12 and 0.13 are both aimed at giving the pirates a bit more mechanical identity and making them more interesting to play – but I expect they’ll remain the simplest faction nevertheless. 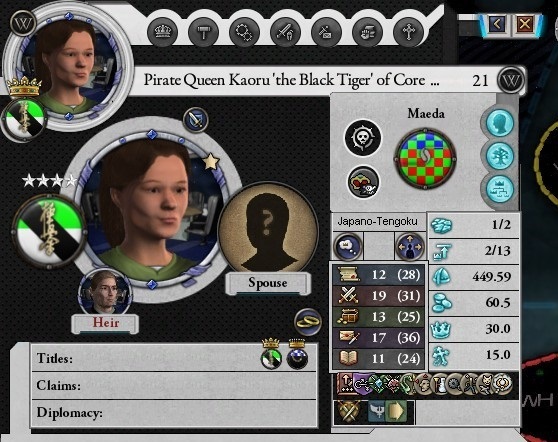 I’ve noticed several Pirate Queen AARs – are there any especially popular characters or challenges? Kaoru is definitely the most popular space pirate ruler, which I always find a bit amusing because I created her specifically as the character a particular friend of mine would want to play. I’ve also noticed that Avalon is very popular, probably because nothing appeals to your average CK2 player quite like eugenics. How does the game typically play out? Is there a “canonical” sequence of events (for instance, the flavour text suggests that Tao Luo overthrows the Terran Confederation)? The canonical history of the COTC setting isn’t quite laid out yet – it’s something we’d like to explore in the future, by adding new scenarios – but broadly speaking, there is an intended game path. Ideally, I’d like the “historical” outcomes to occur maybe twenty percent of the time. Tao Luo most definitely exists for the explicit purpose of overthrowing the Confederation. His personality is designed specifically so that he’ll be at odds with the civilian government and tempted towards the Imperialist ideology, and he provides the ideology quote for a reason. He’s not guaranteed to succeed, of course, but his coup definitely represents the “canon” path. That is pretty cool. Are there any other brewing conflicts (or characters with interesting destinies) that you can tell us about? The Confederation is the main event here, but every faction was designed in such a way that it would have an inherent conflict somewhere down the road. The Orion Reach is supposed to be a democratic republic, but to win the war they’ve created a new class of military governors who might threaten that democracy. Avalon has a division between the Bio-Directionist old guard, and the last heir to the throne in hiding, against the new Neo-Feudal regime. Xin Zizhiqu is a collage of different cultural identities who barely tolerate each other, and they’re in the middle of a border dispute with Novyy Edem. Tarka is minding their own business for now, but the Hiver implant and all the dangers it poses are waiting somewhere in the future. What’s the road map for the mod? At the moment, we’re focused primarily on ironing out bugs (which there are rather a lot of, you may have noticed) and occasionally adding a bit of flavor to minor factions that need it. In a madly idealistic world, I’d like to have the mod in something I could charitably call “version 1.0” by the end of the year, although the viability of that is questionable. First, we can expand in time, exploring the “canonical” history of the COTC setting by adding new start dates after the Crisis itself. As you’ve already guessed, a lot of the flavor text is effectively foreshadowing of some of the concepts we’re going to explore here. Second, we can expand in space, expanding the map beyond the Known Worlds. I think of the map as a series of three concentric rings – Earth in the center, surrounded by the Confederate member states, surrounded by the Periphery. We’d like to add a fourth ring, containing unexplored and unsettled worlds which players can colonize. That second option, of course, opens up some other interesting possibilities, but while I consider myself to be a fairly ambitious modder, I’d rather not get too far ahead of ourselves just yet. Oh, and we fixed that damn civil war bug in 0.13, promise. No idea how that one slipped us by. Yeah. If you’re a game developer in Toronto reading this, hire me so I can move out of my parents’ basement already! …seriously, though, this project has been incredibly fun to work on, and I’m always happy to see that people seem to enjoy it more often than not. There’s something magical about reading someone’s AAR, or watching an LP video, and knowing that I played some small part in making that happen. If I thought I could get away with it, I’d love to just keep pushing this one universe forward forever. As it is, we’ve got some interesting new toys in store for 0.13, and a fix to a certain embarrassing bug you might have mentioned on your blog before. 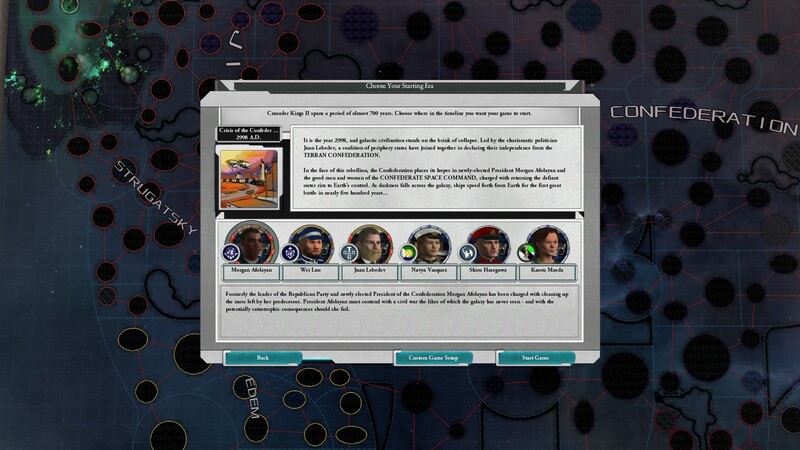 Oh, and that other Paradox space grand strategy game? Challenge accepted. Crisis of the Confederation is available on Steam Workshop.